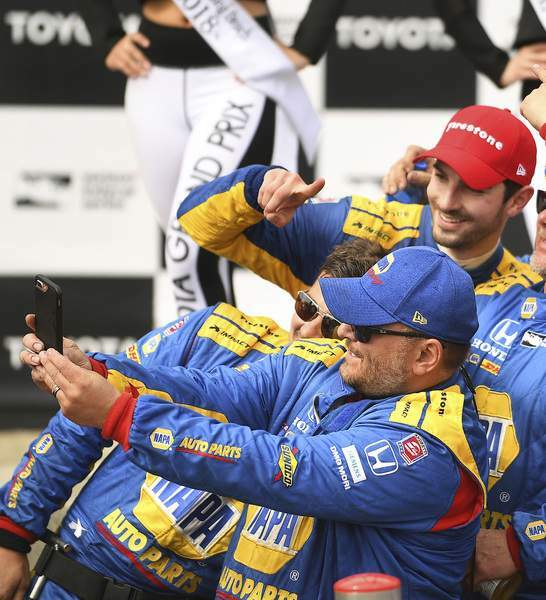 Los Angeles Times (TNS) Alexander Rossi, upper right, takes a selfie Sunday with his team after winning the 2018 Toyota Grand Prix of Long Beach. LONG BEACH, Calif. – Alexander Rossi spent his early racing career in Europe, and his extended family back home in California hardly ever saw him in person. With a chance to race an exceptionally fast Honda on the Long Beach streets in front of about 60 friends and relatives Sunday, Rossi showed everybody what they might have missed. He also demonstrated what his Honda looks capable of doing in the rest of this promising IndyCar season. Ed Jones finished third, and Zach Veach – who had never finished higher than 16th – was fourth. Graham Rahal was fifth after an opening-lap collision with Simon Pagenaud, who was knocked out of the 44th edition of the Long Beach race. Rossi has hit the track at full speed this season after his TV break, reaching the podium twice already in St. Petersburg, Florida, and again last weekend in Phoenix.